It's no secret that we love our pets (two dogs and a cat). 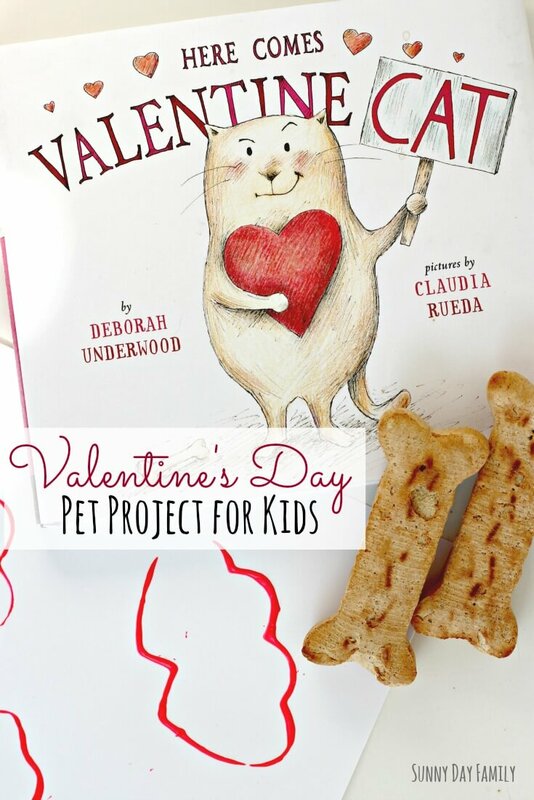 It seems that my boys and I both gravitate towards books and projects that celebrate our animals, and for Valentine's Day, we found the perfect mix of both! We are all big fans of Cat, the grumpy hero of Here Comes the Easter Cat and Here Comes Santa Cat. So when I found out that Cat was back with a new Valentine's Day adventure, I couldn't wait to check it out. The folks at Penguin Kids were nice enough to send me a copy of Here Comes Valentine Cat to review and it inspired us to try a fun pet themed activity too. 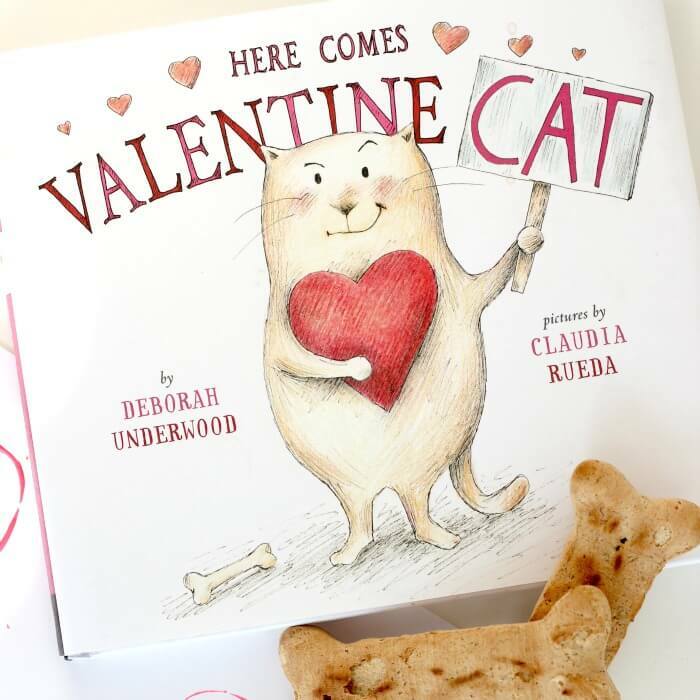 If you're a fan of Deborah Underwood's other Cat books, Here Comes Valentine Cat will not disappoint. And if you haven't discovered them yet, then you do not know what you are missing. Cat is a bit of a curmudgeon in the grand tradition of Garfield and Grumpy Cat. But he has a heart of gold and always comes through in the end. Here Comes Valentine Cat is a really fun book, with lots of gentle humor that's appropriate for even the littlest readers. I love Claudia Rueda's illustrations, which are simple and sweet, and show the many moods of Cat as he navigates Valentine's Day. I love the way the book is written, as if you are talking directly to Cat, and he answers back with his signature picket signs or grouchy looks. The book may seem thick at first for a read aloud, but most pages only have one or two lines, and there are several wordless pages which are really fun for helping spark imagination. My boys love to put their own words to what Cat is thinking on these pages, and it makes the story more interactive and fun. The book also has a sweet Valentine's Day themed message, as Cat comes to realize his new neighbor Dog isn't so bad after all. He decides to make him a valentine, which inspired us to make some valentines for some special dogs of our own. We made our dog themed valentine cards with one of my favorite techniques - paint stamping! 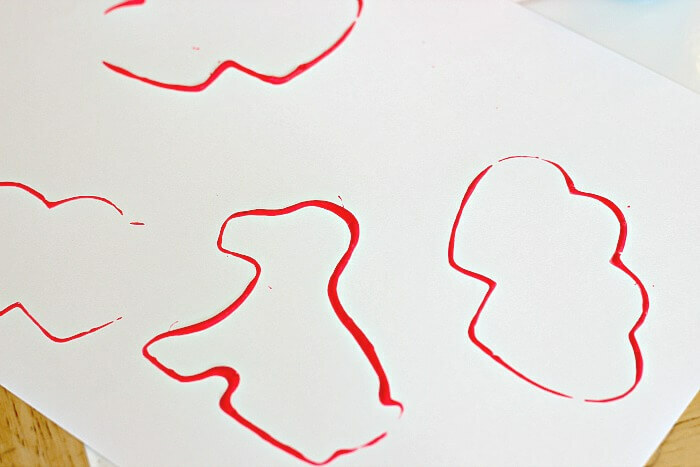 All you need is washable paint, cookie cutters, and thick paper (I like card stock). 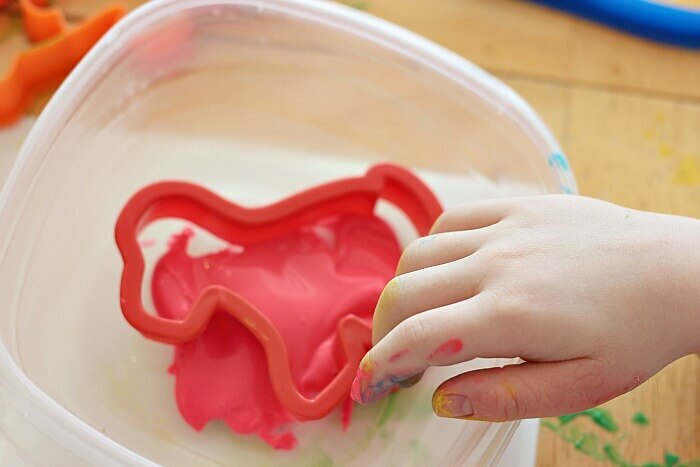 Pour your paint into a shallow dish, then invite your kids to dip the cookie cutters in to create animal shaped stamps. So fun! From here you can get as creative as you want - leave the shapes as is, or fill in with more paint, stickers, or stamps - anything goes. We made a card for each of our pets, then we made some more to take to our local animal shelter. We recently put together a dramatic play animal shelter for our friends at Pre-K Pages, and as part of our activity collected food and treats to take to our local shelter. Our special animal valentines will make a great addition to our basket! Click here to see the rest of our pretend Animal Shelter! Want to make your Pet Valentines even more special? How about making homemade dog cookies! Find our favorite easy recipe here. Want more Valentine's Day ideas? 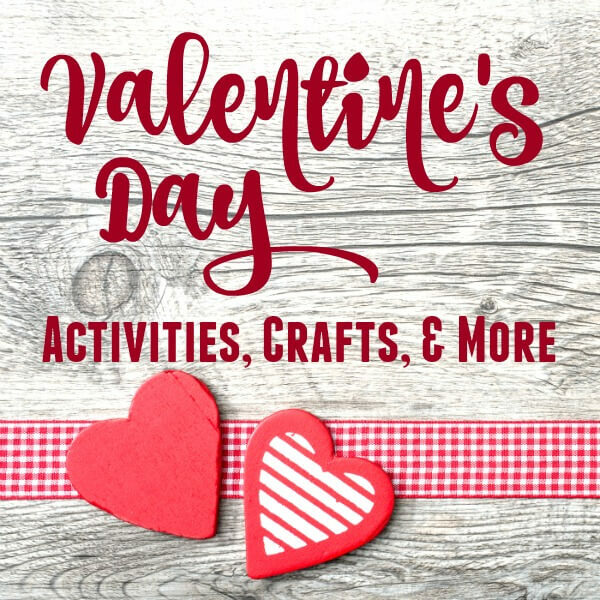 Check out these great activites and crafts! 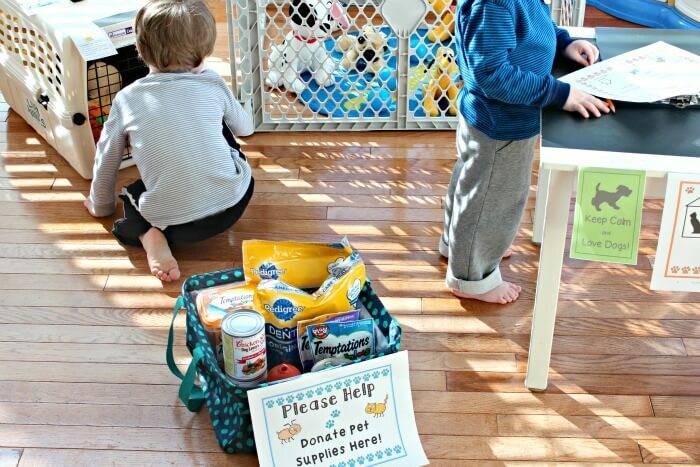 Great idea to incorporate helping real animals into their pretend play! I'm always a fan of helping animals! We love a good cookie stamping activity! Thanks a lot for this article! It will help me to organize the perfect Valentine's day for my family because I really love them.